We're getting dumped on here, 6 inches of snow in the last two hours and more on the way. As such, I'll be outside, plowing. Then I've got writing to do, both Deep Thunder and Iyes of the Dead, both of which I've been neglecting for other more pressing matters. I did manage to finish a chapter of Iyes last week, but I need to get another one done this week. It's coming along and that makes me happy. Two months and I should be done. I'll put up another extract this week. So, anyway, I'm busy today and am a bit burned out on the big, weighty posts. Frankly I'm tired of politics, war, and Berkely Hippy Dippies. This first piece is a hollow-form. 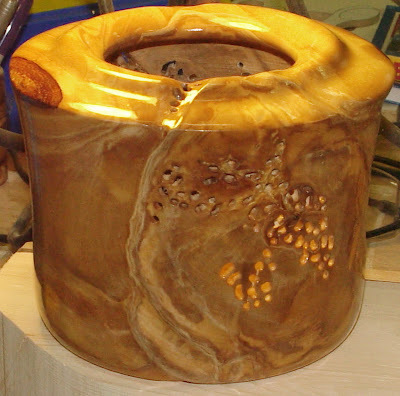 Turned from birch heartwood, relief carved, and finished with Danish Oil. I particularly love the veining and grain patterns of this piece. This second piece is also a hollow-form turned from birch heartwood, in fact it is cut from the same log as the piece above. However this piece came from near the end of the log, and as such there were some soft pulpy ventricles in the wood. Accordingly, I shaped the piece to remove the bad wood. I also 'lipped over' the top, giving it a downward, rounded shape, because that's just how I was feeling that day. I like the form, I think it works very well with this shape. Because there were a number of checks (cracks running across the grain, radiating out from the center like spokes on a wheel), I filigreed the sides - which, when the light shines through, reminds me of frothing white water. I like it. Jim? I'm still waiting for a list of pieces you will sell to your bloggy fans. Because Beastly never sent me a pic of his work for sale. Slacker. I really, really like that first piece. Is it for sale? Can I start a biddng war? Or do I just need to "commission" a piece of my own? I'm certainly willing to do that, if that's what it takes. Beautiful. I too would be interested in acquiring or commissioning some of that good wood. By the way, I think Janiece has reached the limit on avatar changes during a single month. She should be stuck with "Mad Cow" at least until the end of February. OK, Give me until the end of the week. I'm finishing several additional pieces at the moment. I will post pictures and prices of all at the end of the week and you all may decide then if you want them. Janiece, I will set the piece you like aside - sorry folks, first come, first served, however I will make more similar to that one if you specifically request one. Thanks, Jim. I have a serious case of the "I wants" when it comes to that piece. And I just happen to have an open spot on my desk for it. Wow! I can't wait top see the rest of your pieces and the prices. Janiece I must defend myself here... I stripped the finish on the zebrawood bowl (6" X 3") and refinished it. One more coat and it's getting photographed. So there. BTW Jim, Nice Bowls! Show off! Will the prices be posted in US dollars, or Alaskan dollars? There's no such thing as 'Alaskan' dollars, Shawn. Here in the Great Land we barter for the things we desire with salmon and moose meat, and the shiny bobbles we salvage from the wreckage of the tourist RV's. Is that just grain showing through on the top one or is it textured on the outside? It looks like a texture. I know we're going to have some leftover baked ziti tonight. What percent of a bowl will that buy? I really like the top item--the one without the holes. The sheen is gorgeous. And I don't have any fresh salmon here. How about cookies? Nathan, it is both the grain and texturing. 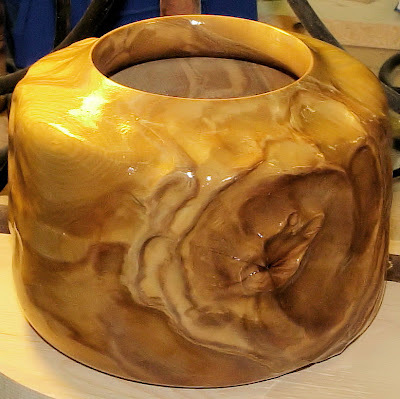 I relief carve along the grain lines to emphasize the natural patterns in the heartwood. I will post better pictures this weekend, including close-ups and a scaled item for size comparison. Proper lighting will show the texturing in better detail. And it depends on the Ziti. Is the mozzarella fresh? We don't call 'em holes, dear Michelle. Hole is non-arty sounding. We calls 'em filigree - because it sounds more artistic when it rolls off your tongue. :) And cookies are acceptable barter: dutch process chocolate with chocolate chip and chocolate fudgey frosting - a cross between fudge and brownies. Hot, fresh. Nothing less than 4 dozen or 6 inches in diameter... oh, and don't scrimp on the chocolate. Wright's motto: if it doesn't have chocolate - it's not a cookie, it's a biscuit. Mozzarella - Not fresh, but I overpaid. Does that count? Don't skimp on the chocolate. HA! I've got an excellent chocolate chocolate chip recipe. And I use Baker's Catalogue dutch process chocolate and Ghiradelli chocolate chips. Best thing about those cookies is that you can make the dough, freeze it, and then bake as few or as many cookies at any time with no effort. Freeze? Freeze the dough? Why? You bake it, all of it, immediately. Then eat the cookies off the sheet pan as they come out of the oven. Freeze dough for later? I don't get it. Because it's nice to be able to have hot cookies to eat without work, when I need them. You know, bad day, you're exhausted, don't want to move, need chocolate, and LOOK! Just preheat oven, drop frozen cookies on silicone mats, put cookies in oven, pour large glass of milk and PRESTO! The day is instantly better! That and if I eat more than two or three sweets at once, it makes me ill.
Ah, you mean it's an emergency stock pile - now I understand. I like the way you think - consider yourself added to the lifeboat list. - and I know what you mean about too many sweets. For me it's chocolate - I can't live without it (and wouldn't want to), but it gives me migraines, bad migraines. Michelle, get your greedy little eyes off my bowl. I'll fight for it like a mama warthog defending her piglets. I'm warning you. And Jim? I'm willing to throw in some more apple butter along with the cash. Beastly, I'm still interested in your zebra wood piece. Let me know when it's ready. I switched over to those from Nestle, 'cause Costco stocked 'em (now they don't anymore) but it's too late. I can. not. go. back. GF wants to know if you do anything in Birch, and if so, what kind of Birch. She's duly impressed with the Action Hero's sensitive side. Nathan, tell GF I work almost exclusively in Alaska Birch, a subspecies of North American white birch. The difference is that Alaska Birch is way cooler (heh heh). You have my sympathy. If chocolate gave me migraines I might die. Michelle, I get migraines about once a month or so. Mostly mild, some nausea, but mostly blinding pain right behind my eyes. Chocolate some times triggers it, some times cures it. Tomato sauce also does it on occasion. They don't immobilize me, usually.